The observance of the International Day for Disaster Reduction for 2008 takes place in a year that has seen more than its fair share of natural calamities, and falls on the third anniversary of the earthquake in South Asia. With the casualties of that disaster and of this year’s Wenchuan Earthquake and Cyclone Nargis still fresh in our minds, it is all the more appropriate to recall the lessons we have learned. Nearly four years ago, Governments adopted the Hyogo Framework for Action, which aims to reduce our collective vulnerability to natural hazards. But we must do more to turn commitments on paper into deeds that can keep the next major disaster from taking so many lives and destroying so many livelihoods. Now more than ever, when we are trying to accelerate national and international efforts to achieve the Millennium Development Goals, disaster risk reduction needs to be acknowledged and incorporated as a key plank of that work. The threats posed by climate change – including increasing droughts, floods and storms – increases the urgency further still, particularly in the world’s poorest, most vulnerable communities. I urge all partners – Governments, civil society, international financial institutions and the private sector -- to step up implementation of the Hyogo Framework. Disaster risk reduction is everybody’s business. Only by investing in tangible risk reduction measures can we reduce vulnerability and protect development. On this International Day, let us renew our dedication to this vital task. The difference in cost between building a safe and an unsafe hospital can be negligible – on average 4% of the cost of the facility. But that tiny investment can mean the difference between life and death, or between a chronically unhealthy community and one that develops sustainably. During disasters, those who are injured need urgent medical attention. Those who have escaped injury still require medical services in the long term, but after a disaster public health is often forgotten. When health services and hospitals fail due to disaster, people die and suffer needlessly both during the disaster and long afterwards. What is being done to make hospitals, health facilities and systems, and health workers safe from disasters? Does your organization have a project or initiative that should be showcased as a good practice example for others? UNISDR Secretariat and WHO are collecting good practices on making hospitals safe from disasters, including initiatives on: structural and non-structural safety, keeping hospitals working through disasters, and hospital and staff preparedness. Good practices will be selected from submissions for a publication to be launched on International Day for Disaster Reduction 2009. Deadline for submissions is 30 May 2009. To submit full details of your good practice, please download the template here. 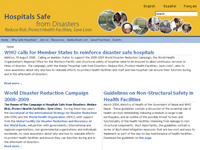 An information and resource hub for the World Disaster Reduction Campaign 2008-2009: Hospitals Safe from Disasters, that will serve as an ongoing resource beyond the end of the campaign. Visit the website regularly for more on the development (including regional versions) of the Hospital Safety Index - a tool that provides an initial snapshot of a health facility’s safety level, key events like next year’s World Health Day which will complement the Hospitals Safe from Disaster campaign, global resources for health practitioners and managers of health facilities, news about the campaign, multimedia resources such as DVDs and video clips, and media resources. The global event will be a high level panel in New York featuring representatives of countries that have suffered major disasters, including China, and that have since focused closely on protecting critical infrastructure such as health facilities and schools. The event will also announce the launch of www.safehospitals.info as the global website of the Hospitals Safe from Disaster campaign. UNISDR with the ASEAN Secretariat will hold an Award Ceremony for a regional drawing competition called Safer Community - Hospital, School and House of My Dream, and organize a roundtable discussion on the issue. UNISDR and partners will hold an event in Cairo involving a broad spectrum of stakeholders, from academic institutions and hospital directors, to civil society organizations. UNISDR and WHO will also launch the Campaign’s regional framework, a regional version of the Hospital Safety Index and a PSA. Coordinating with UN Country Teams, UNISDR West Asia North Africa will plant trees and encourage tree planting by other UN Country Teams across the region to fight desertification, drought and climate change. To mark the International Day for Disaster Reduction, Pakistan will hold its National Conference on Disaster Management and a two-day expo on disaster risk reduction, organized by the National Disaster Management Authority with the support of the South Asian Resources Centre. The Government of South Africa will hold celebrations culminating on 16 October in Mpumalanga with a street parade and drama competitions. The Disaster Management Institute of Southern Africa is holding a major conference near Cape Town on 8-9 October. UNISDR and the Pan American Health Organization will be launching a photography contest on safe hospitals, and planning outreach activities with regional hospitals and health facilities to commemorate the day. The 3rd Economic Cooperation Organization Conference on Disaster Risk Management will be held 7-8 October, supported by UNISDR Secretariat. There will also be a knowledge fair and media training.